There's a lot to be said for knowing what you want to do when you're so young, with many of us spending years trying to figure out what is is we want to do. But for others, blessed with talent, that decision becomes a little easier to make. Leo Jaegle is only 16 yet he's got himself quite the following in France. 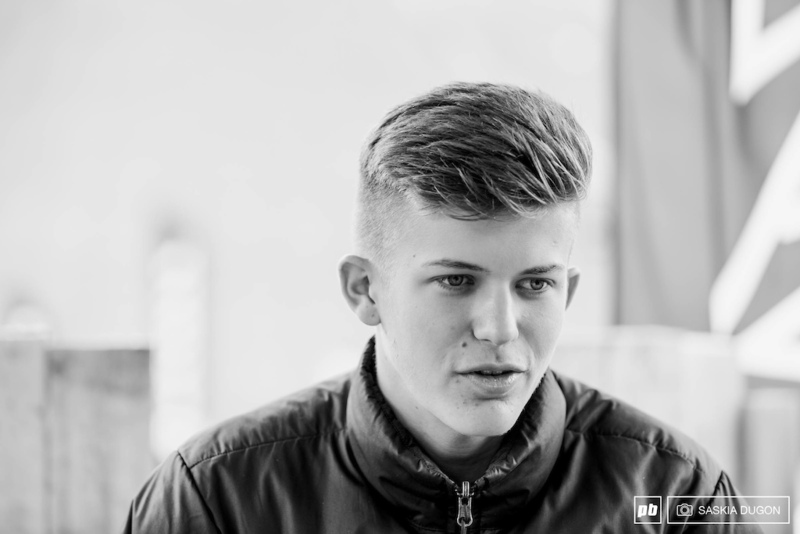 Known for his flamboyant skills on the bike, he's already had multiple sponsorship deals during the past few years and whilst you may not know his name from the race circuit, rest assured, it's a name you may come to know in years to come. Despite his age, he's already got a fair idea of what he wants to do - ride his bike for fun, meet new people and travel the world. As a recent signing for Intense France, this dream may well become reality, and with his talents, we're sure to see some great things come from Leo in the future. 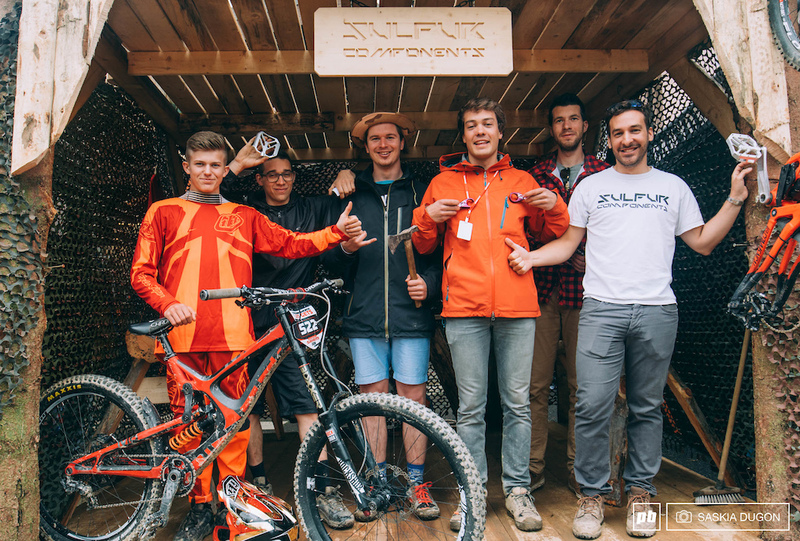 We checked in with him at Crankworx, Les Gets and got to know a little more about this young French rider. You recently had your riding video on Pinkbike, which did really well - what’s the reception been like? It was really cool to see how many views we had and to see that people liked what we did, it was my first professional video too so I’m happy. Tell me about you, when did you start riding? I started riding six years ago. Before riding (mountain) bikes I did a lot of quad and moto riding. I don’t really want to go down the competition route, it’s more about riding for fun and meeting people. How did you actually get into riding in the first place? My dad brought me to the bike park once and I loved it straight away so we continued going and now I go riding with friends and it’s a bit of a family thing. You’re only 16, you’ve already had various sponsorship deals and offers, how have you got to this point? When I’m not at school and the weather is good I am always riding. I don’t really have any specific training or do anything special. 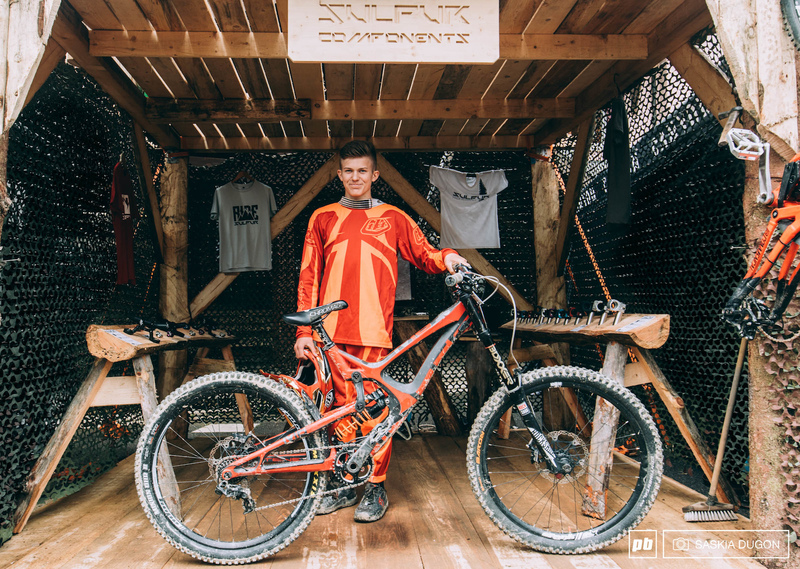 Leo with his new bike at the Sulfur tent, Crankworx, Les Gets 2016. I live in Alsace - it’s in northern France near Germany and that’s the main place I ride. What’s the riding like near home? There are two main bike parks, one is La Bresse where we made the video - it’s also known for World Cups and also in Lac Blanc which is another bike park, but all around the Vosges, a couple of mountains in Northern France. I ride all around there and I like to go to the Alps when I have time. 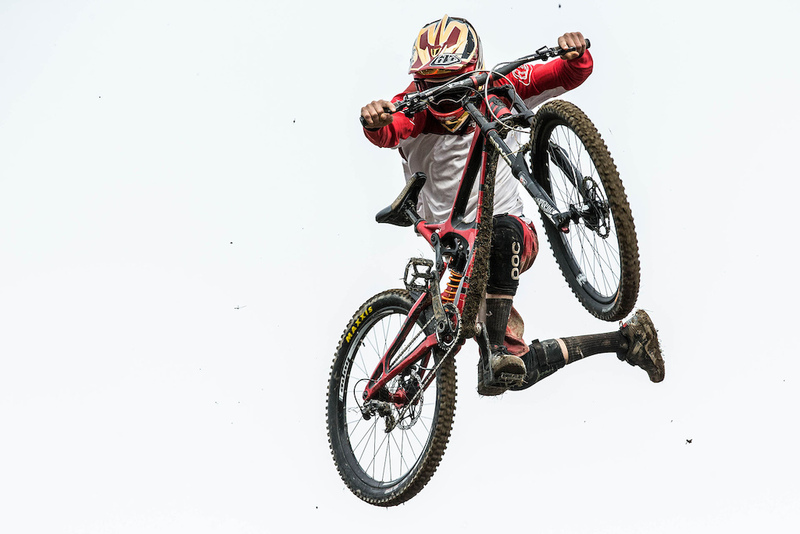 Do you ride just downhill, or do you enjoy other disciplines too? I do dirt jumping also and a bit of enduro, not just downhill. Leo may be young but he's got a good head on his shoulders. You’ve had support from Sulfur Components from the start and you’ve just signed with Intense France too, how did that all come about? A guy from Intense contacted me to see if I would be interested in signing with them... I didn’t know anyone there. How did Intense become aware of you? A friend of mine knows someone at Intense and he talked to him about me and they got in touch and it went from there. I know you said riding wasn’t about racing for you, but have you done any in the past? I’m doing a few competitions this season and I did a few last year but it’s all about fun for me, I don’t want to be number one or anything like that. 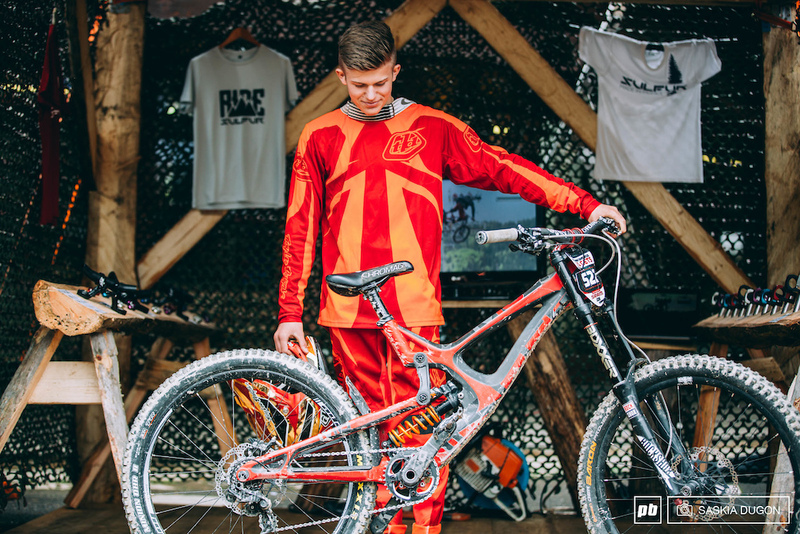 Only 16 but he's already had multiple sponsorship deals and been involved in product development. After the success of your recent edit are you hoping to do more? Following the video I’ve had sponsorship offers from around the world but I still want to keep doing what I’m doing, but this may change if I get more sponsors in the future. For now, it’s all about fun. What else do you do aside from riding? I’m still in school at the moment but when I’m not at school I’m riding my bikes or motorbikes. 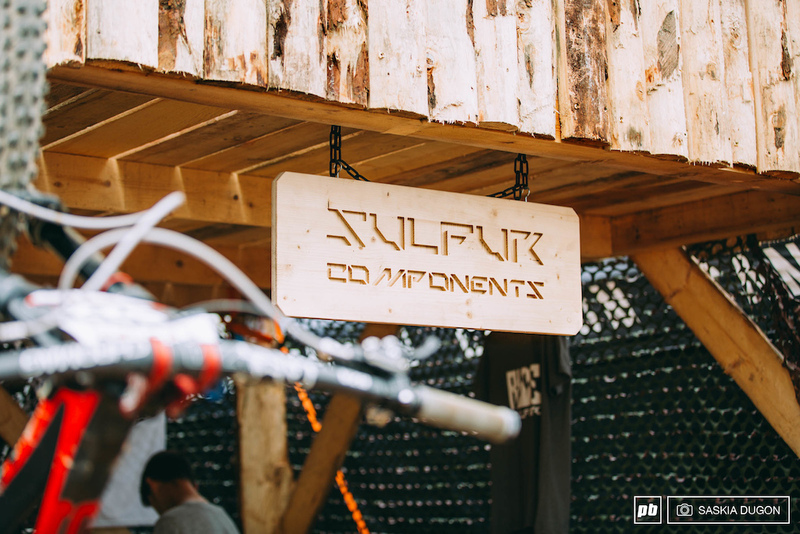 Intense France and Sulfur Components, two brands that believe in Leo's talent. 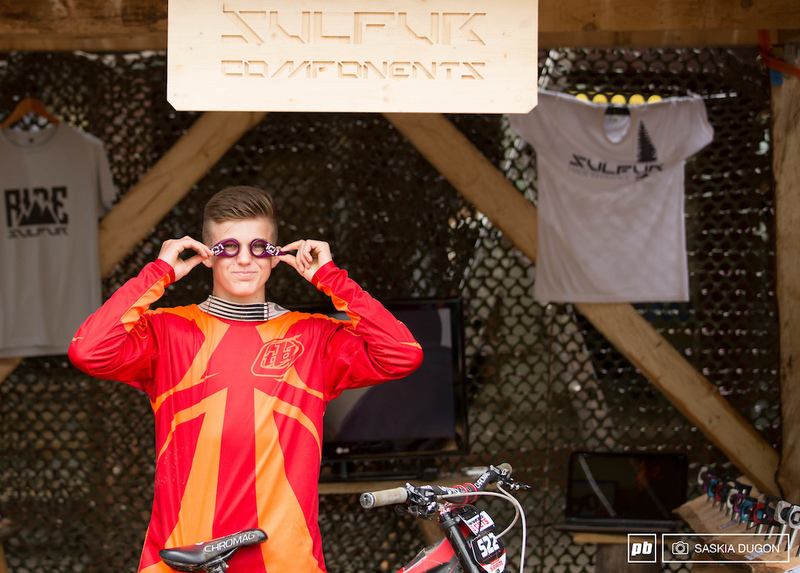 Leo at the whip-off at Crankworx Les Get. Photo: Szymon Nieborak. 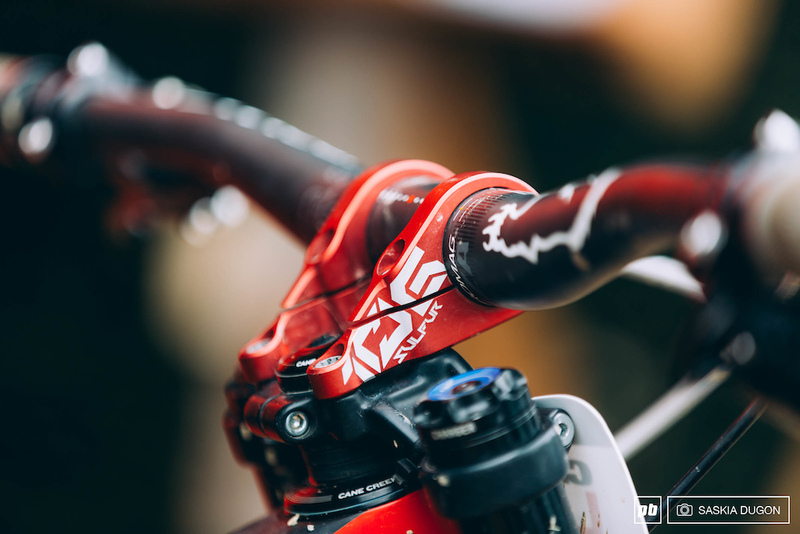 You’ve recently signed with Intense France, how’s the bike and how are things going for you? At first, I was sponsored by Banshee France then I moved to Devinci and I got a frame deal, then I bought myself a Trek and this is the first year on Intense for me. Talk me through your bike set up? I really like my new bike, I do all the set up myself and just ride what feels right but Sulfur have helped me a lot when it comes to suspension settings. What is your deal with Intense, do you have a contract? I have an ambassador contract with Intense that entitles me to discount but basically, I have my own shop that means I get the bike for free and they are helping me but Intense give me great discount. Leo and the Sulfur Components crew. You run Sulfur Components on the Intense, what support do you get from them? I get stems and I worked with them to help develop the rise and the position of the handlebars for the stems. Is there anything you like to ride in particular? I like jumps a lot but I like a bit of everything; bike park, freeride, roots. Everything is good for me. Is there a particular reason you don’t really want to race and is this likely to change? For now I don’t think it will change. It’s the atmosphere and the pressure that surrounds competition that I don’t enjoy, it’s not as good as riding for fun. That’s the reason why, competition isn’t my goal, I don’t want to be number one I just want to meet people and enjoy it. There's always time for some fun. What’s the ultimate dream for you with you riding? My dream would be to ride all around the world and to be able to travel, traveling is my big dream. I’m not really into competing but I’d like to travel to discover new spots and meet new people and keep making videos and doing projects. According to 'my' logic, I'm almost 3 times this dudes age. Which should make me at least 3 times radder.....right?! I rode with him few years ago when he was 13 / 14 yo. At this time I had more than 15 years of DH riding behind me (I'm 33) and he put me ashamed in no time, mad skills and nice style ! Keep on Léo ! Salut mec! je suis super content que cette aventure t'arrive, je te suis pas depuis longtemps mais je t'ai en ami fb, j'adore vraiment ce que tu fais, tu fais ça pour le fun comme tu l'as dit à de nombreuse fois, toujours un régale de regarder tes vidéos, t'as un talent fou, la france a de la relève avec toi c'est clair! j'espère te croiser une fois sur les pistes, keep on. Good luck to him, no harm in turning his back on racing. Talent only gets you so far in racing, ask most of the riders outside the top 20. He can be sure of a great life filming and travelling. Take That 5 10! That's your marketing strategy out the window! I don't mind his riding do the talking, like Danny Hart or Gwin few years ago. What no out takes at the end of the vid, not even a low side to give us mere mortals some belief that this kid is human! Yeah Leo Great to see you there on Pinkbike you deserve it. get well soon and catch up in the local Bike Park ! Someone needs to hook this kid up with FestSeries, just based on this short interview seems like he'd fit right in! He is half my age. I am probably not half as talented. His rotors cost the same as my vehicle the i was 16.